Iran’s top diplomat is in India as part of international consultations aimed at discussing continued mutual cooperation with world countries now that the US has quit a multi-lateral nuclear accord with the Islamic Republic. 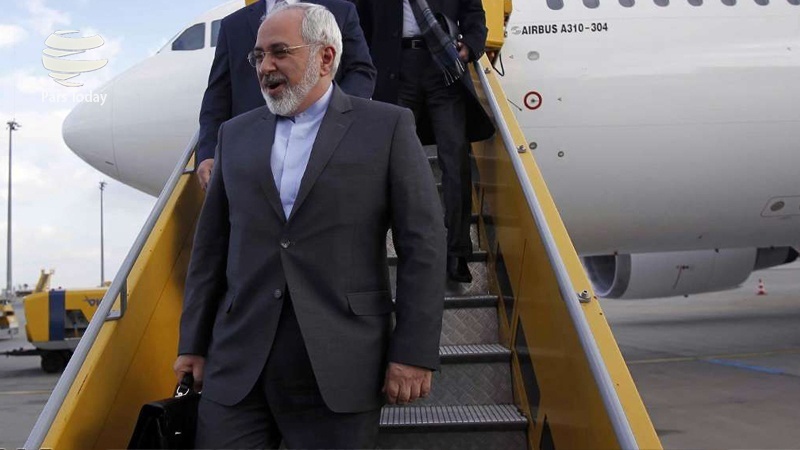 Foreign Minister Mohammad Javad Zarif’s plane touched down in New Delhi on Monday, with a delegation of political and economic officials tagging along. Some of the consultations have taken place so far, and some will happen in the future, he said at the airport. “We maintain extensive consultations with New Delhi as a regional political and economic partner these days, especially now that the United States has violated the JCPOA,” he added. Zarif was referring to the Joint Comprehensive Plan of Action between Iran and the five permanent members of the United Nations Security Council — the US, the UK, France, Russia, China, and Germany. So far, Zarif has visited China, Russia, and Brussels to address the aftermath of a May 12 announcement by Washington that it would leave the deal and re-introduce its nuclear-related sanctions against Tehran. Now, the other signatories to the deal have to choose between following in the US footsteps or remaining in the accord and risk angering Washington. All had warned Washington against leaving the accord as it could not be terminated by a single party due to being a multi-national one, which has been ratified as a Security Council resolution. All, too, have vowed to do their utmost to preserve the accord, which they hail as a pillar of regional and international peace and stability. “In other areas, like trade and transportation too, there lies good ground for cooperation,” he said. Some other Iranian officials have also been visiting various countries to discuss post-US withdrawal cooperation. On Monday, Beijing said that Iranian President Hassan Rouhani was to attend a summit with his Chinese and Russian counterparts in the country next month. China’s President Xi Jinping will meet Rouhani on the sidelines of the Shanghai Cooperation Organization (SCO) meeting from June 9-10 in the eastern city of Qingdao, said Chinese Foreign Minister Wang Yi. Russian President Vladimir Putin will also attend the summit, he added. “Our hope is that China and Iran will have close consultation on the basis of observing the deal and push forward development of bilateral cooperation,” Chinese Deputy Foreign Minister Zhang Hanhui said at a briefing. The nuclear deal is expected to take center stage at the bilateral talks.